Abstract: The ability to interactively edit BRDFs in their final placement within a computer graphics scene is vital to making informed choices for material properties. We significantly extend previous work on BRDF editing for static scenes (with fixed lighting and view), by developing a precomputed polynomial representation that enables interactive BRDF editing with global illumination. Unlike previous recomputation based rendering techniques, the image is not linear in the BRDF when considering interreflections. We introduce a framework for precomputing a multi-bounce tensor of polynomial coefficients, that encapsulates the nonlinear nature of the task. Significant reductions in complexity are achieved by leveraging the low-frequency nature of indirect light. We use a high-quality representation for the BRDFs at the first bounce from the eye, and lower-frequency (often diffuse) versions for further bounces. 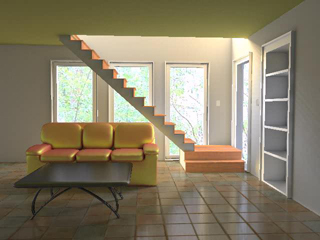 This approximation correctly captures the general global illumination in a scene, including color-bleeding, near-field object reflections, and even caustics. We adapt Monte Carlo path tracing for precomputing the tensor of coefficients for BRDF basis functions. At runtime, the high-dimensional tensors can be reduced to a simple dot product at each pixel for rendering. We present a number of examples of editing BRDFs in complex scenes, with interactive feedback rendered with global illumination. Abstract: Current systems for editing BRDFs typically allow users to adjust analytic parameters while visualizing the results in a simplified setting (e.g. unshadowed point light). This paper describes a real-time rendering system that enables interactive edits of BRDFs, as rendered in their final placement on objects in a static scene, lit by direct, complex illumination. All-frequency effects (ranging from near-mirror reflections and hard shadows to diffuse shading and soft shadows) are rendered using a precomputation-based approach. Inspired by real-time relighting methods, we create a linear system that fixes lighting and view to allow real-time BRDF manipulation. In order to linearize the image's response to BRDF parameters, we develop an intermediate curve-based representation, which also reduces the rendering and precomputation operations to 1D while maintaining accuracy for a very general class of BRDFs. Our system can be used to edit complex analytic BRDFs (including anisotropic models), as well as measured reflectance data. We improve on the standard precomputed radiance transfer (PRT) rendering computation by introducing an incremental rendering algorithm that takes advantage of frame-to-frame coherence. We show that it is possible to render reference-quality images while only updating 10% of the data at each frame, sustaining frame-rates of 25-30fps. Lawrence, Jason; Ben-Artzi, Aner; DeCoro, Chris; Matusik, Wojciech; Pfister, Hanspeter; Ramamoorthi, Ravi; Rusinkiewicz, Szymon. Inverse Shade Trees for Non-Parametric Material Representation and Editing. ACM Transactions on Graphics, July 2006 (SIGGRAPH 2006). [pdf][1st author's site]. Abstract: Recent progress in the measurement of surface reflectance has created a demand for non-parametric appearance representations that are accurate, compact, and easy to use for rendering. Another crucial goal, which has so far received little attention, is editability: for practical use, we must be able to change both the directional and spatial behavior of surface reflectance (e.g., making one material shinier, another more anisotropic, and changing the spatial "texture maps" indicating where each material appears). We introduce an Inverse Shade Tree framework that provides a general approach to decomposing high-dimensional measured datasets of appearance into sampled 1- and 2-dimensional functions. 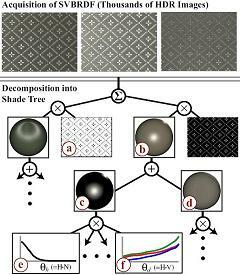 These functions, the leaves of the shade trees, can capture both the directional behavior of individual materials and their spatial mixing patterns. In order to compute the trees from measured data automatically, we map the problem to matrix factorization and introduce a flexible new algorithm that allows for constraints such as non-negativity, sparsity, and energy conservation. We evaluate our approach with a prototype system that includes interactive rendering and editing tools for manipulating these representations. We demonstrate the ability to reduce multi-gigabyte measured datasets of the Spatially-Varying Bidirectional Reflectance Distribution Function (SVBRDF) into a compact representation that may be edited in real time. Overbeck, Ryan; Ben-Artzi, Aner; Grinspun, Eitan; Ramamoorthi, Ravi. Exploiting Temporal Coherence for Incremental All-Frequency Relighting. Eurographics Symposium on Rendering 2006. [pdf][1st author's site]. Abstract: Precomputed radiance transfer (PRT) enables all-frequency relighting with complex illumination, materials and shadows. To achieve real-time performance, PRT exploits angular coherence in the illumination, and spatial coherence in the light transport. Temporal coherence of the lighting from frame to frame is an important, but unexplored additional form of coherence for PRT. In this paper, we develop incremental methods for approximating the differences in lighting between consecutive frames. We analyze the lighting wavelet decomposition over typical motion sequences, and observe differing degrees of temporal coherence across levels of the wavelet hierarchy. To address this, our algorithm treats each level separately, adapting to available coherence. The proposed method is orthogonal to other forms of coherence, and can be added to almost any all-frequency PRT algorithm with minimal implementation, computation or memory overhead. We demonstrate our technique within existing codes for nonlinear wavelet approximation, changing view with BRDF factorization, and clustered PCA. Exploiting temporal coherence of dynamic lighting yields a 3??4? performance improvement, e.g., all-frequency effects are achieved with 30 wavelet coefficients per frame for the lighting, about the same as low-frequency spherical harmonic methods. Distinctly, our algorithm smoothly converges to the exact result within a few frames of the lighting becoming static. Abstract: This paper addresses the problem of efficiently calculating shadows from environment maps. Since accurate rendering of shadows from environment maps requires hundreds of lights, the expensive computation is determining visibility from each pixel to each light direction, such as by ray-tracing. We show that coherence in both spatial and angular domains can be used to reduce the number of shadow rays that need to be traced. Specifically, we use a coarse-to-fine evaluation of the image, predicting visibility by reusing visibility calculations from four nearby pixels that have already been evaluated. This simple method allows us to explicitly mark regions of uncertainty in the prediction. By only tracing rays in these and neighboring directions, we are able to reduce the number of shadow rays traced by up to a factor of 20 while maintaining error rates below 0.01%. For many scenes, our algorithm can add shadowing from hundreds of lights at twice the cost of rendering without shadows. A successful teacher imparts not only their knowledge, but also their enthusiasm and enjoyment of the subject. Every teacher would be blessed to have students who are already excited about every aspect of the new material. But usually, that excitement only comes as a result of having learned the subject and mastering it. The best teachers I have seen, and the ones whom I emulate are those who succeed in first imparting the motivation, and then presenting the information. I believe the best way to do this is to ground the new knowledge in tangible examples that students can appreciate without full knowledge of their inner workings. I TAed the courses below. The summers before the Fall 2001 Database class, and the Fall 2003 Graphics class, I redesigned most of the projects and homeworks to update those courses.